The ComedyCritic.com When describing Lahna Turner’s act, ComedyCritic.com says, “No small laughs… some of the best musical comedy I’ve ever heard,” while All Access Magazine proclaims, “Lahna is truly hilarious.” Turner’s unique talent of blending stand-up with original comedy songs makes for an unforgettable performance. She has played at top comedy clubs and theaters all around the world, along with numerous tours for the USO. Lahna has appeared on NBC, Comedy Central, and VH1, and has been featured as a commentator on CMT Insider. She pitched and appeared in pilots for Showtime and VH1, and will soon be seen in indie film “Teacher Of The Year,” as well as an episode of the “The Dog Whisperer.” Her YouTube channel has received hundreds of thousands of hits. 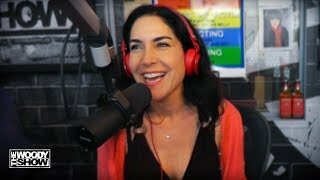 Lahna’s two comedy albums, “If These Lips Could Talk” and “D! @k Jokes and Other Assorted Love Songs,” have received airplay at top radio stations across the country. Her music has also been on National Lampoon’s Top 40 comedy countdown and is currently in rotation on Sirius Satellite Radio. Aside from balancing a busy career and tour schedule, Lahna divides her time between Nashville and Los Angeles with her husband, two children, and two dogs.